My first experience helping out at a race was so totally awesome and I'm super excited to find an opportunity for more volunteering in the future. I was at the Nuun hydration stop along the Seattle Rock N Roll Marathon course. It's no secret that I love Nuun and having an opportunity to hang out with some of my favorite running brethren and Nuunies, while also checking out this whole Rock N Roll Marathon thing, was a no brainer. Dawn and I helped with setup and were on the road from the Eastside by 5:30AM. By around 6AM we were mixing huge vats o' Nuun with members of the sample team and filling up four long tables with rows and rows of solo cups. By 7AM we were joined by a group of fellow Nuun enthusiasts - Lauren, Sarah, Rebecca, Meghan, and Rira. Within 15 minutes, the elite runners started passing by and shortly thereafter everything became a blur of: grab the cups, hand out the cups, run back to the table and repeat. For the first few waves of folks, I held two cups at a time: one held out (with my fingers on top, so people could grab from the bottom) and the another on standby in my other hand. I quickly realized that I could grab up to four cups with my fingers in one hand, and have the other at the ready (holding five total) and I still had a hard time keeping up - it was CRAZY, and we were an extra station! I also learned that sometimes runners would point to the person that they were going to grab water from - this was really helpful when someone would point to me and I'll totally do this in my next race. I never thought of it, but it lessens confusion and the possibility of your water getting handed to someone else and waiting extra precious seconds for another cup. We all jumped in where help was needed, so I'd take a break from handing out Nuun when we were low on cups to grab - which happened a lot. My head was bent over all those cups with my full pitcher of Nuun quite a bit, filling them as fast as I could without knocking them over. Despite this, I was able to see my Bootcamp instructor cruise by, as well as teammates Morena and Nolana, Zoe and Kerrie, Robyn, Stacie - pretty much everyone I knew that was running, other than Lauren , Allyson and Lena (sorry I missed ya!). It looked like everyone was having a great time, and based on the recaps I've read, they all really enjoyed the new course. Despite my dislike for huge and expensive races, I may just entertain the idea of running it one day... But hanging with Nuun and cheering this race might be a more fun tradition! So, when I'd see a girl come running (I picked ones that were wearing sparkly things), I'd yell "you look like a mermaid!!" and I got the BEST smiles. HA! This was so ridiculously fun. Lauren also came up with "you are great at running!" This also elicited some big grins. I also found that pointing right at people, looking them in the eye and saying "YOU are awesome!" got good results. 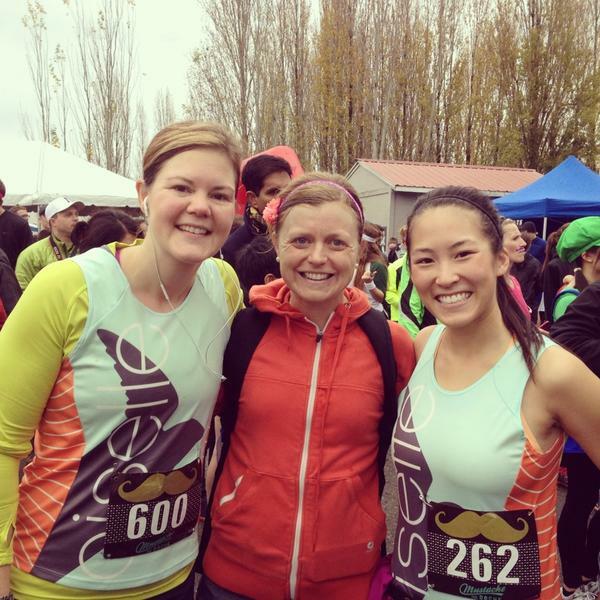 Getting people to smile at mile 10 of a half marathon was really, really gratifying. I highly recommend giving it a try. Speaking of spectating, if you missed it this weekend, here's the video of the gals I mentioned on Friday running the 800M final - Alysia winning (!) on Sunday and teammate Kate Grace coming in fourth with a PR of 2:02:14! And lastly, if you've never sat and watched a live stream an Ironman finish line (or been lucky enough to watch in person), you are MISSING OUT. It's just so inspirational and I was so excited to catch them calling out "Dimity Davis, you are an Ironman!" as it was happening live. And I also caught seasoned Ironman teammate Cathleen crossing the finish and winning her age group! Yeah, it was a pretty darn inspiring weekend. Congrats to all on such great races! Glad you had so much fun volunteering at the race. It sounds like you had the best water station on course! Watching IM in person is beyond amazing. It was well worth my 5 am wake up call on Sunday to be there. I really want to cross becoming an Ironman off of my bucket list someday. You didn't miss me, I took Nuun right from you...hehe :). But it looked CRAZY there so I could see why you missed me. Love those cheering lines especially the "you are good at running"...LOL! I'm going to use that next time. Thanks so much for coming out, I was REALLY looking forward to seeing you ladies after I90 and your energy totally carried me to the finish! I loved watching Dimity too! So inspiring! And thanks for posting the video of the cheering. I had never seen that before. I will totally be channeling that at my husband's 5k next weekend!